An email archiving solution is now a requirement in business to ensure that emails are not lost, storage space is kept to a minimum, and emails can be retrieved on demand. While native Microsoft Exchange Email Archiving is available, many businesses will find the archiving options come up short. The alternative is to use a third-party email archiving solution. Not only will this provide all the features required by businesses, it will improve efficiency and will save on cost. To meet the requirements of businesses and improve efficiency, TitanHQ developed ArcTitan: A secure, fast, cloud-based email archiving solution. What is Email Archiving and Why is it Important? Federal, state, and industry regulations require businesses to retain emails for many years. Storing emails can take up a considerable amount of storage space, especially considering the volume of emails that are typically sent and received on a daily basis by employees. While businesses can get away with storing emails in backups to meet legal requirements, backups are not searchable. If emails need to be recovered, they need to be recovered quickly. That is simply not possible with backups as they are not searchable. The solution is an email archive. In contrast to backups, email archives are searchable, and messages can be retrieved on-demand quickly and with minimal effort. The importance of an email archiving solutions for eDiscovery cannot be underestimated. There have been many cases where businesses have received heavy fines for the failure to produce emails as part of the eDiscovery process. For instance, in the Zubulake v. USB Warburg case, the plaintiff was awarded $29 million as a result of the failure to produce emails. In Coleman Holdings v. Morgan Stanley, eDiscovery failures resulted in a fine of $15 million. Email archives are now essential for GDPR compliance. Sine the EU’s General Data Protection Regulation came into effect on May 25, 2018, companies have been required to produce – and delete – on request every element of an individual’s personal data, including personal data contained in emails. Without an email archive, this can be incredibly time consuming and may result in data being unlawfully retained since backups are not searchable. The fines for GDPR compliance failures can be as high as €20 million or 4% of global annual revenue, whichever is greater. Native Microsoft exchange email archiving provides businesses with journaling and personal archive functions, but each has its drawbacks. The functions meet some business requirements, such as freeing up space in mailboxes, but they lack the full functions of a dedicated archive and do not meet all eDiscovery requirements. 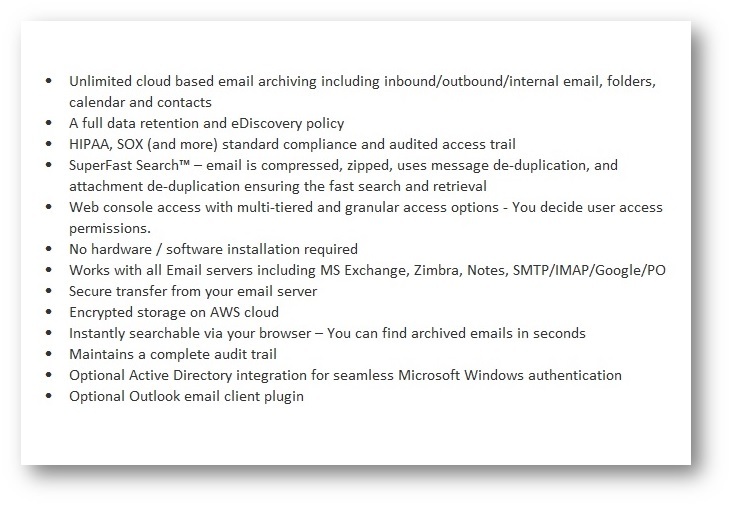 Wirth native Microsoft Exchange email archiving, end users have far too much control over the information that is loaded into an archive and they can delete emails unless a legal hold is activated. For admins, the control panel is difficult to use and retrieving emails can be complicated and time consuming. Native Microsoft Exchange email archiving functions fail to meet the needs of many businesses, especially those in highly regulated industries. While the native Microsoft Exchange email archiving functions have improved over the years, there are limitations with most product versions and archiving can be complex with certain email architectures. Any business that uses multiple email systems alongside Microsoft Exchange will require a third-party email archiving solution. Microsoft Exchange does not support the archiving of email from other platforms. Email archiving has improved with Office 365. SMBs that use Office 365 have email archiving functionality included in their plans, but it is only free of charge with E3-E5 plans. Other plans charge around $3 per user, which is more expensive than custom-built archiving solutions such as ArcTitan. Native Microsoft Exchange email archiving is an option for businesses, but Microsoft Exchange was not developed for email archiving. A third-party solution for email archiving on Microsoft Exchange is still a requirement, despite the improvements that have been made by Microsoft. A third-party email archiving solution will save your IT department a considerable amount of time trying to locate old messages, especially for the typical requests that are received which are light on detail. The advanced search options in ArcTitan make search and retrieval of messages much faster and easier. ArcTitan has been developed specifically for email archiving and email archiving alone. ArcTitan has been designed to meet all archiving needs of businesses and allow managed service providers to offer email archiving to their clients. The benefits of ArcTitan include lighting fast email archiving and message retrieval, secure encrypted storage, and compliance with industry regulations such as HIPAA, SOX, SEC, FINRA, and GDPR. ArcTitan ensures businesses meet eDiscovery requirements without having to pay for additional eDiscovery services from Microsoft. With ArcTitan, an accurate audit trail is maintained, and businesses have near instant access to all company emails. ArcTitan serves as a black box recorder for all email to meet all eDiscovery requirements and ensures compliance with federal, state, and industry regulations. ArcTitan requires no hardware or software, is quick and easy to install, and easily slots in to the email architecture of businesses. The solution is highly scalable (there are no limits on storage space or users), it is lightning fast, easy to use, and stores all emails safely and securely. Businesses that have yet to implement a Microsoft Exchange email archiving solution typically save up to 75% storage space and costs are kept to a minimum with a flexible pay as you go pricing policy, with subscriptions paid per live user. If you have yet to implement an email archiving solution, if you are unhappy with the native Microsoft Exchange email archiving features, or find your current archiving solution expensive or difficult to use, get in touch with TitanHQ today to find out more about the benefits of ArcTitan and the improvements it can make to your business.